^ 1.0 1.1 2015 Formula 1 Shell Belgian Grand Prix. Formula1.com. Formula One Administration. [2015-08-16]. （原始内容存档于2015-07-11） （英语）. ^ World Motor Sport Council 2014 – Beijing. FIA.com (Fédération Internationale de l'Automobile). 2014-09-12 [2015-03-01]. （原始内容存档于2015-08-07） （英语）. ^ World Motor Sport Council 2014 – Doha. FIA.com (Fédération Internationale de l'Automobile). 2014-12-03 [2015-03-01]. （原始内容存档于2015-03-19） （英语）. ^ Pirelli opt for aggressive tyre choice for Italy. Formula1.com. Formula One World Championship Limited. 2015-06-18 [2015-08-16]. （原始内容存档于2015-08-04） （英语）. ^ Collantine, Keith. Drivers prefer Spa’s old ‘Bus Stop’ chicane. F1Fanatic. 2015-08-20 [2015-08-21]. （原始内容存档于2015-08-23） （英语）. ^ Collantine, Keith. FIA removes new kerb from Eau Rouge/Raidillon. F1Fanatic. 2015-08-22 [2015-08-22]. （原始内容存档于2015-08-24） （英语）. 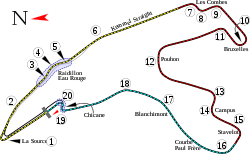 ^ 7.0 7.1 Belgian GP - Off again at a classic circuit. Scuderia Ferrari. [2015-08-23]. （原始内容存档于2015-08-24） （英语）. ^ Kimi Raikkonen handed contract extension by Ferrari for 2016. The Guardian. 2015-08-19 [2015-08-23]. （原始内容存档于2015-08-24） （英语）. ^ Mercedes F1 W06 Hybrid - Spa-Francorchamps rear wing. FIA. 2015-08-23 [2015-08-24]. （原始内容存档于2015-08-25） （英语）. ^ Tech: Mercedes' twisted wing explained. autosport.com. [2015-08-24]. （原始内容存档于2015-08-25） （英语）. ^ Somerfield, Matt. Tech Corner: Mercedes Spa Updates. planetf1.com. 2015-08-25 [2015-08-26]. （原始内容存档于2015-08-26） （英语）. ^ Red Bull RB11 - rear wing updates. FIA. 2015-08-26 [2015-08-26]. （原始内容存档于2015-08-26） （英语）. ^ Anderson, Ben. Honda aiming to match Ferrari with Formula 1 power unit update. autosport.com. 2015-08-17 [2015-08-25]. （原始内容存档于2015-08-25） （英语）. ^ Galloway, James. McLaren-Honda expect 'difficult' Belgian GP despite new-spec engine. Sky Sports. 2015-08-18 [2015-08-25]. （原始内容存档于2015-08-20） （英语）. ^ McLaren MP4-30 - slotted tea tray. FIA. 2015-08-24 [2015-08-26]. （原始内容存档于2015-08-20） （英语）. ^ 2015 Driver Standings. FIA. [2015-08-25]. （原始内容存档于2015-08-20） （英语）. ^ 2015 Constructor Standings. FIA. [2015-08-25]. （原始内容存档于2015-08-20） （英语）. ^ 18.0 18.1 Pre-Spa analysis - McLaren the big winners of start changes?. formula1.com. FIA. 2015-08-21 [2015-08-21]. （原始内容存档于2015-08-22） （英语）. ^ Anderson, Ben. New Formula 1 grand prix start rules 'a big change' - Nico Rosberg. autosport.com. 2015-07-17 [2015-08-21]. （原始内容存档于2015-07-25） （英语）. ^ Exclusive Daniel Ricciardo Q&A: Start changes could help Red Bull. formula1.com. FIA. 2015-08-20 [2015-08-21]. （原始内容存档于2015-08-20） （英语）. ^ Rencken, Dieter; Parkes, Ian. Lotus facing threat of F1 cars being impounded following Belgian GP. autosport.com. 2015-08-21 [2015-08-22]. （原始内容存档于2015-08-22） （英语）. ^ Practice and qualifying. FIA. [2015-06-21]. （原始内容存档于2015-07-02） （英语）. ^ 23.0 23.1 Roberts, James. Belgian GP: Nico Rosberg leads Lewis Hamilton in first Spa practice. autosport.com. 2015-08-21 [2015-08-21]. （原始内容存档于2015-08-24） （英语）. ^ Barretto, Lawrence; Parkes, Ian. Belgian GP: Pastor Maldonado says F1 practice crash 'very unlucky'. autosport.com. 2015-08-21 [2015-08-22]. （原始内容存档于2015-08-24） （英语）. ^ Andrew, Benson. Jolyon Palmer gets Lotus practice role for remaining European races. BBC. 2015-06-11 [2015-08-25]. （原始内容存档于2015-06-20） （英语）. ^ Collantine, Keith. 'Just lucky' I didn't hit the wall – Rosberg. F1Fanatic. 2015-08-21 [2015-08-22]. （原始内容存档于2015-08-25） （英语）. ^ Barretto, Lawrence. Belgian GP: Mercedes' Nico Rosberg tops practice before tyre blows. autosport.com. 2015-08-21 [2015-08-21]. （原始内容存档于2015-08-22） （英语）. ^ Parkes, Ian. Belgian GP: 'External cut' caused Nico Rosberg tyre blow - Pirelli. autosport.com. 2015-08-22 [2015-08-22]. （原始内容存档于2015-08-25） （英语）. ^ Barretto, Lawrence; Beer, Matt. Belgian F1 GP: Nico Rosberg not reassured over tyres after blowout. autosport.com. 2015-08-25 [2015-08-22]. （原始内容存档于2015-08-25） （英语）. ^ Collantine, Keith. Hamilton to the fore in final practice. F1Fanatic. 2015-08-22 [2015-08-22]. （原始内容存档于2015-08-25） （英语）. ^ Collantine, Keith. Hamilton storms to pole as Ferrari falter at Spa. F1Fanatic. 2015-08-22 [2015-08-22]. （原始内容存档于2015-08-25） （英语）. ^ Rose, Gary. How Belgian GP qualifying unfolded. BBC. 2015-08-22 [2015-08-22]. （原始内容存档于2015-08-25） （英语）. ^ Anderson, Ben. Belgian F1 GP: Mercedes' Lewis Hamilton extends pole streak at Spa. autosport.com. 2015-08-22 [2015-08-22]. （原始内容存档于2015-08-22） （英语）. ^ Benson, Andrew. Lewis Hamilton on Belgian GP pole ahead of Nico Rosberg. BBC. 2015-08-22 [2015-08-22]. （原始内容存档于2015-08-26） （英语）. ^ Barretto, Lawrence; Beer, Matt. Belgian F1 GP: Nico Rosberg not reassured over tyres after blowout. autosport.com. 2015-08-22 [2015-08-22]. （原始内容存档于2015-08-25） （英语）. ^ 38.0 38.1 Benson, Andrew. Lewis Hamilton on Belgian GP pole ahead of Nico Rosberg. BBC. 2015-08-22 [2015-08-22]. （原始内容存档于2015-08-26） （英语）. ^ Parkes, Ian. Belgian F1 GP: McLaren's Button and Alonso resigned to lonely race. autosport.com. 2015-08-22 [2015-08-22]. （原始内容存档于2015-08-26） （英语）. ^ Pre-Spa analysis – McLaren the big winners of start changes?. formula1.com. FIA. 2015-08-21 [2015-08-21]. （原始内容存档于2015-08-22） （英语）. ^ Barretto, Lawrence. McLaren F1's Alonso and Button get 'free' new Hondas for Hungary. autosport.com. 2015-07-23 [2015-08-21]. （原始内容存档于2015-08-01） （英语）. ^ Parkes, Ian. Belgian F1 GP: McLaren's Button and Alonso have second Honda change. autosport.com. 2015-08-22 [2015-08-22]. （原始内容存档于2015-08-26） （英语）. ^ McLaren set to start at rear of Spa grid. formula1.com. FIA. 2015-08-21 [2015-08-21]. （原始内容存档于2015-08-22） （英语）. ^ 45.0 45.1 45.2 Barretto, Lawrence. McLaren to make double engine changes on both F1 cars at Spa. autosport.com. 2015-08-20 [2015-08-21]. （原始内容存档于2015-08-20） （英语）. ^ Benson, Andrew. Belgian Grand Prix: McLaren given 105-place grid penalty. BBC Sport (BBC). 2015-08-22 [2015-08-22]. （原始内容存档于2015-08-26） （英语）. ^ 47.0 47.1 Collantine, Keith. Verstappen set for engine penalty, Kvyat reprimanded. F1Fanatic. 2015-08-21 [2015-08-22]. （原始内容存档于2015-08-25） （英语）. ^ 48.0 48.1 Barretto, Lawrence. Belgian F1 GP: Romain Grosjean handed penalty for gearbox change. autosport.com. 2015-08-22 [2015-08-22]. （原始内容存档于2015-08-23） （英语）. ^ 49.0 49.1 Parkes, Ian. Belgian GP F1: Ferrari's Kimi Raikkonen gets gearbox penalty. autosport.com. 2015-08-23 [2015-08-23]. （原始内容存档于2015-08-23） （英语）. ^ 50.0 50.1 50.2 50.3 Rose, Gary. How the Belgian GP unfolded. BBC. 2015-08-23 [2015-08-23]. （原始内容存档于2015-08-23） （英语）. ^ 51.0 51.1 51.2 51.3 McVeigh, Niall. F1: Lewis Hamilton wins the Belgian Grand Prix 2015 – as it happened. The Guardian. 2015-08-23 [2015-08-23]. （原始内容存档于2015-08-24） （英语）. ^ 52.0 52.1 McVeigh, Niall. F1: Lewis Hamilton wins the Belgian Grand Prix 2015 – as it happened. The Guardian. 2015-08-23 [2015-08-23]. （原始内容存档于2015-08-26） （英语）. ^ 53.0 53.1 Richards, Giles. Ferrari’s Sebastian Vettel unhappy with Pirelli after tyre explosion. The Guardian. 2015-08-23 [2015-08-24]. （原始内容存档于2015-08-24） （英语）. ^ Belgian GP: Post-race F1 press conference transcript. autosport.com. 2015-08-23 [2015-08-25]. （原始内容存档于2015-08-27） （英语）. ^ F1: Sebastian Vettel attacks Pirelli after late tyre failure at Belgian Grand Prix. The Guardian. 2015-08-23 [2015-08-24]. （原始内容存档于2015-08-24） （英语）. ^ Collantine, Keith. Rosberg wants action on tyres before Monza. F1Fanatic. 2015-08-23 [2015-08-24]. （原始内容存档于2015-08-28） （英语）. ^ Collantine, Keith. Pirelli says drivers should be given maximum stint lengths for its tyres. F1Fanatic. 2015-08-23 [2015-08-24]. （原始内容存档于2015-08-28） （英语）. ^ Noble, Jonathan. Pirelli found more tyre cuts over Belgian GP weekend. motorsport.com. 2015-08-24 [2015-08-25]. （原始内容存档于2015-08-28） （英语）. ^ Coulthard, David. David Coulthard column: Vettel right to tackle Pirelli on tyres. BBC. 2015-08-24 [2015-08-26]. （原始内容存档于2015-08-25） （英语）. ^ Sebastian Vettel defends Ferrari strategy after tyre blow-out during Belgian GP. The Guardian. 2015-08-25 [2015-08-26]. （原始内容存档于2015-08-28） （英语）. ^ Benson, Andrew. Lewis Hamilton eases to Belgian GP win ahead of Nico Rosberg. BBC. 2015-08-23 [2015-08-24]. （原始内容存档于2015-08-28） （英语）. ^ Esler, William. Jenson Button brands McLaren's Belgian GP an 'embarrassment'. Sky Sports. 2015-08-24 [2015-08-24]. （原始内容存档于2015-08-24） （英语）. ^ Collantine, Keith. Kerbs contributed to Maldonado’s retirement. F1Fanatic. 2015-08-23 [2015-08-24]. （原始内容存档于2015-08-28） （英语）. ^ Barretto, Lawrence; Anderson, Ben. Pastor Maldonado's Belgian GP retirement was self-inflicted – Lotus. autosport.com. 2015-08-24 [2015-08-25]. （原始内容存档于2015-08-28） （英语）. ^ Hughes, Mark. Why Romain Grosjean is still seriously under-rated in F1. Sky Sports. 2015-08-26 [2015-08-26]. （原始内容存档于2015-08-28） （英语）. ^ Collantine, Keith. Williams to investigate bizarre Bottas tyre mix-up. F1Fanatic. 2015-08-24 [2015-08-25]. （原始内容存档于2015-08-28） （英语）. ^ 2015 Driver Standings. FIA. [2015-08-25]. （原始内容存档于2015-08-28） （英语）. ^ 2015 Constructor Standings. FIA. [2015-08-25]. （原始内容存档于2015-08-28） （英语）. ^ 2015 Formula 1 Shell Belgian Grand Prix - Qualifying results. Formula1.com. Formula One Administration. 2015-08-22 [2015-08-22]. （原始内容存档于2015-08-22） （英语）. ^ 2015 Formula 1 Shell Belgian Grand Prix - Race results. Formula1.com. Formula One Administration. 2015-08-23 [2015-08-24]. （原始内容存档于2015-08-24） （英语）. ^ Collantine, Keith. 2015 Belgian Grand Prix result. F1Fanatic. 2015-08-23 [2015-08-24]. （原始内容存档于2015-08-25） （英语）.